It should be a gradual shift, with minimal impact on pay. For example, suppose all workers over 50 take a one-hour cut in their working week each year. If they start with a 40-hour week, they can be doing 30 hours at 60 and 20 hours at 70. And suppose all young people entering the labour market for the first time start on a 30-hour week – and stay that way, with each new cohort adding to the numbers, until it becomes the new “normal”. What if all workers in organisations where there is an annual round of pay negotiations were to trade a bit more time each year for a smaller pay rise? Mounting pressures at work are taking a heavy toll on life at home. Employees say their bosses want them to put job before family, and many are expected to be on call around the clock. More than one in four say they work longer hours than they want to, we learn from the latest YouGov poll. It’s not a pretty picture: an economy where high levels of stress and anxiety are normal, where people get ill because they’ve lost control of their time, where marriages are damaged and children suffer. And yet, it’s a picture we’re invited to applaud. Our political leaders idolise “strivers” and “hard-working people”, not “chilled-out, caring dads”, for example. The longer and harder we work, the more admirable we are supposed to be. I am old enough to remember lunchtime. When my workmates and I went out to a nearby eaterie for at least an hour, scoffed a proper meal and probably a glass of wine. These days, like most worker bees, I stay at my desk with my fork and Tupperware pot, nose glued to the screen. And I‘ve become so mesmerised by the modern working culture that I’d be quite shocked to find a colleague dining out at lunchtime. No booze, no siestas, no playtime. It seems a bit odd when we hear so much about automation and “the end of work”. If the robots are coming, why are we rushed off our feet? In fact, it’s all part of the same picture. All the main UK political parties insist that the only successful economy is one that grows, preferably faster than other economies. Growth calls for greater productivity: getting more output per unit of input. The system is greedy for more resources, but workers and machines have to do more for less. More efficient processes (including more robots) reduce the amount of human input required. So those who have jobs must work harder – and longer hours – to hang on to what they’ve got and to keep the economy growing. Meanwhile, since robots can’t do everything yet, there are new flurries of low-end jobs with zero-hours contracts, insulting pay and no security. This class has been called the “precariat” and much of it thrives on the over-busyness of other workers. It ferries people home at night (Uber), delivers fast food (Deliveroo) and fixes things around the house (TaskRabbit). Many precarious workers have to do two or three jobs just to make ends meet. 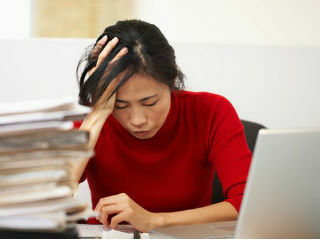 So they are under heavy pressures too, often torn between poverty and an intolerable work-life balance. What can we do about it? First, take back control of the workplace. This means workers in all settings finding ways to organise and build up bargaining rights. For the casualised precariat, it could mean building new digital platforms to rival the technological giants that have cornered the market so far. Second, let us never forget that this is a challenge for men as well as women. Much of the stress and unhappiness that women experience at work is because they take on most of the unpaid work at home. Until men really share the housework and childcare, they are unlikely to be powerful advocates for a more humane regime in the workplace. And third, let’s move to shorter hours of paid work for everyone, not just women. This has long been argued by the New Economics Foundation and there is growing evidence of its many benefits. Nobody should have to work more than four days or 30 hours a week, even in today’s 24-7 economy. As some jobs are automated out of existence, others could be created to cover the hours left unworked by the newly unstressed. All this should go hand in hand with a higher minimum wage, more generous child benefit and a more secure “social income” in terms of high-quality services that are collectively funded and provided (education, health and social care, childcare, housing and so forth). If lousy wages force people to work around the clock, the problem is pay: it’s not a sensible argument against shorter hours. If 30 hours became the new standard working week, for women and for men, across all kinds of jobs, from doctors to delivery drivers, from teachers to task-rabbits, there would be a lot less stress and anxiety at work and at home. We’d have more control over our lives, more time to look after one another. We could slow down and relax more – and rely less on carbon-intensive fast food and travel. We’d have more time to be active in our communities and in politics. We’d have more time to campaign for a new working culture that respects love, family and friendship instead of fetishising “hard work”. And most importantly of all we could build an economy that enables people to flourish, instead of one that is entirely fixated on growth. *Anna Coote is head of social policy for Nef - the New Economics Foundation.